About two years after she started taking the hormone replacement therapy drug Prempro, Gayle Lewers went in for a routine mammogram. "A couple of days later, I got a call from my doctor," Lewers recalls. "He said I had a tumor." Surgeons discovered Lewers actually had five tumors in both breasts, so she had to have a double mastectomy and a grueling six months of chemotherapy. Ten years later, Lewers is doing well. But she had an emotional setback a few weeks ago when she heard about a study that linked Prempro with an increased risk of breast cancer. "I thought, 'Oh, my God, I took this medicine,' " says Lewers, 59, of Lake Zurich. "I called my daughter crying." Then, she called a lawyer. Lewers is one of four named plaintiffs in a class-action lawsuit filed in federal court in Chicago by the law firm Kenneth B. Moll & Associates against Wyeth Inc., the drug company that makes Prempro. Lewers is suing Madison, N.J.-based Wyeth for personal injury compensation. She believes Prempro caused her breast cancer because she has no family history of the disease, she never smoked, she doesn't drink and Prempro was the only drug she was taking. Moll & Associates, of Chicago, is one of a half-dozen firms across the country--from Kansas City, Mo., to Philadelphia--to file similar lawsuits against Wyeth. The class-action suits were filed after federal health officials in July halted a clinical study of the risks and benefits of hormone replacement therapy. The study of 16,000 women was part of the Women's Health Initiative, which was launched in 1991 by the National Institutes of Health to investigate various health issues of postmenopausal women. Half of the WHI participants took Prempro, a combination of estrogen and progestin, and half took a placebo. Researchers discovered women who took Prempro for five years had a 26 percent higher chance of developing breast cancer than women who took the placebo. Scientists also found a 41 percent higher risk of strokes, 29 percent higher risk of heart attacks and 100 percent higher risk of blood clots. "The cardiovascular and cancer risks of estrogen plus progestin outweigh any benefits," said NIH researcher Dr. Claude Lenfant. Sonia Kinra, a Moll & Associates attorney working on the Prempro case, has been taking calls from hundreds of women who are worried they will develop breast cancer because they took Prempro. The firm has been contacted by more than 3,000 women worldwide, she said. "They took this drug hoping to alleviate other problems," Kinra says. "It's the not knowing that makes them so nervous." To give those women peace of mind, the Chicago suit is asking Wyeth to set up a medical monitoring fund, which will pay for mammograms and other diagnostic tests for women who took Prempro. The lawsuit also asks Wyeth to give any women who took Prempro a refund for prescriptions they had filled in the past. Most of the five other class-action lawsuits filed against Wyeth over Prempro include the same demands. 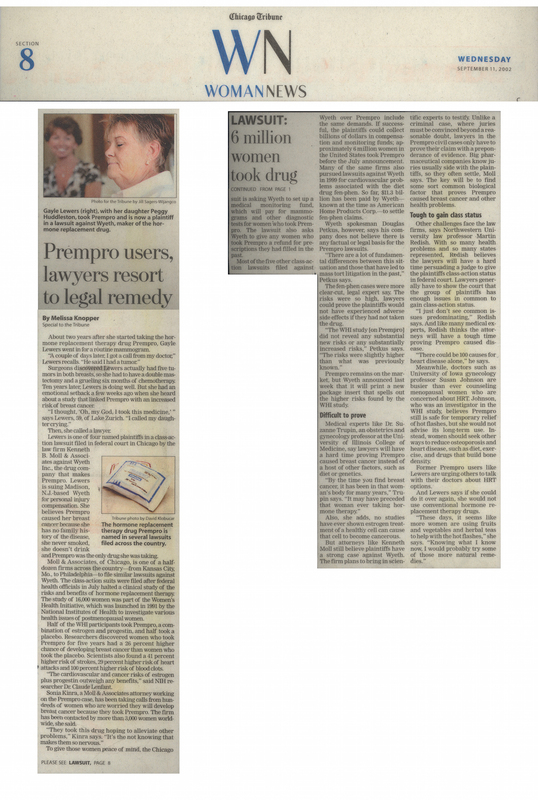 If successful, the plaintiffs could collect billions of dollars in compensation and monitoring funds; approximately 6 million women in the United States took Prempro before the July announcement. Many of the same firms also pursued lawsuits against Wyeth in 1999 for cardiovascular problems associated with the diet drug fen-phen. So far, $11.3 billion has been paid by Wyeth--known at the time as American Home Products Corp.--to settle fen-phen claims. Wyeth spokesman Douglas Petkus, however, says his company does not believe there is any factual or legal basis for the Prempro lawsuits. "There are a lot of fundamental differences between this situation and those that have led to mass tort litigation in the past," Petkus says. The fen-phen cases were more clear-cut, legal expert say. The risks were so high, lawyers could prove the plaintiffs would not have experienced adverse side effects if they had not taken the drug. "The WHI study [on Prempro] did not reveal any substantial new risks or any substantially increased risks," Petkus says. "The risks were slightly higher than what was previously known." Prempro remains on the market, but Wyeth announced last week that it will print a new package insert that spells out the higher risks found by the WHI study. Medical experts like Dr. Suzanne Trupin, an obstetrics and gynecology professor at the University of Illinois College of Medicine, say lawyers will have a hard time proving Prempro caused breast cancer instead of a host of other factors, such as diet or genetics. "By the time you find breast cancer, it has been in that woman's body for many years," Trupin says. "It may have preceded that woman ever taking hormone therapy." Also, she adds, no studies have ever shown estrogen treatment of a healthy cell can cause that cell to become cancerous. But attorneys like Kenneth Moll still believe plaintiffs have a strong case against Wyeth. The firm plans to bring in scientific experts to testify. Unlike a criminal case, where juries must be convinced beyond a reasonable doubt, lawyers in the Prempro civil cases only have to prove their claim with a preponderance of evidence. Big pharmaceutical companies know juries usually side with the plaintiffs, so they often settle, Moll says. The key will be to find some sort common biological factor that proves Prempro caused breast cancer and other health problems. Other challenges face the law firms, says Northwestern University law professor Martin Redish. With so many health problems and so many states represented, Redish believes the lawyers will have a hard time persuading a judge to give the plaintiffs class-action status in federal court. Lawyers generally have to show the court that the group of plaintiffs has enough issues in common to gain class-action status. "I just don't see common issues predominating," Redish says. And like many medical experts, Redish thinks the attorneys will have a tough time proving Prempro caused disease. "There could be 100 causes for heart disease alone," he says. Meanwhile, doctors such as University of Iowa gynecology professor Susan Johnson are busier than ever counseling menopausal women who are concerned about HRT. Johnson, who was an investigator in the WHI study, believes Prempro still is safe for temporary relief of hot flashes, but she would not advise its long-term use. Instead, women should seek other ways to reduce osteoporosis and heart disease, such as diet, exercise, and drugs that build bone density. Former Prempro users like Lewers are urging others to talk with their doctors about HRT options. And Lewers says if she could do it over again, she would not use conventional hormone replacement therapy drugs. "These days, it seems like more women are using fruits and vegetables and herbal teas to help with the hot flashes," she says. "Knowing what I know now, I would probably try some of those more natural remedies."